The error rate of translation is between 10-3 to 10 ~'J. That is, no more than 1 in every 1,000 amino acids incorporated into protein is incorrect. The iiltimate basis for the selection of the correct aminoacyi-tRNA is the base pairing between the charged tRNA and the codon displayed in the A site of the ribosome. Despite this, the energy difference between a correctly formed codon-anticodon pair and that of a near match cannot account for this level of accuracy. In many instances only one of the three possible base pairs in the anticodon-codon inter-action is mismatched, yet the ribosome rarely allows such mismatched aminoacyl-tRNAs to continue in the translation process. 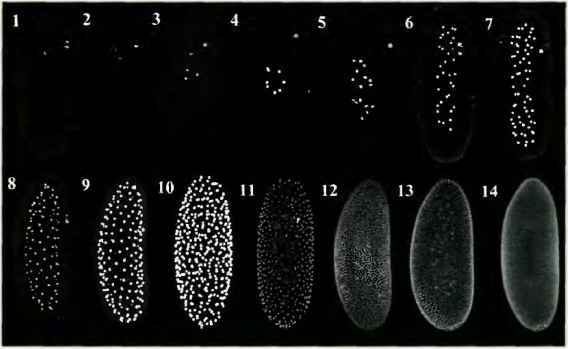 At least three different mechanisms contribute to this specificity (Figure 14-34). In each case, these mechanisms selcct oga/nsf incorrect codnn-anticodon pairings. FIGURE 14-30 Summary of the steps of translation. 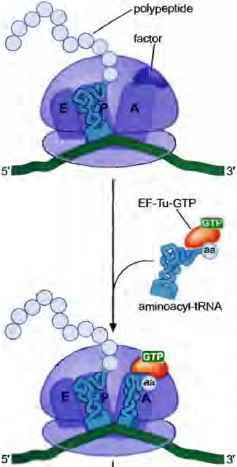 FIGURE 14-51 EF-Tu escorts aminoacyf-tRNA to the A site of the ribosome. 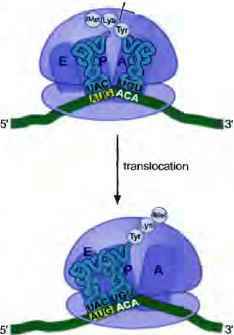 Charged tRMAs are bound to EF Tu-GTP as they first interact with the A site of the ribosome When tine correct codon-anticodon in teraaion occurs, €FTu interacts with the factor binding center, hydrolyzes its bound OTP and is released from the tRNA and the ribosome. first two bases of the codon (Figure 14-32a). As you will recall (see Figure 6-10), the edges of a G:C and an A:U base pair are very similar in the minor groove. The adjacent A residues in the IBS rRNA do not discriminate between G:C or A:L) base pairs and recognize either as correct, in contrast, non-Watson-Crick base pairs form a minor groove that cannot be recognized by these bases, resulting in significantly reduced affinity for incorrect tRNAs. The net result of these interactions is that correctly paired tRNAs exhibit a much lower rate of dissociation from the ribosome than do incorrectly paired tRNAs. 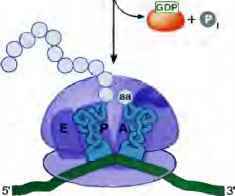 A second mechanism that helps to ensure correct codon-anticodon pairing involves the GTPase activity of EF-Tu (Figure l4-34b). As described above, release of EF-Tu from the tRNA requires GTP hydroi-ysis, which is highly sensitive to correct codon-auticodon base pairing. Even a single mismatch in the codon-anlicodon base pairing leads to a dramatic reduction in EF-Tu GTPase activity. This mechanism is an example of kinetic selectivity and is related to the mechanisms used to ensure correct base-pairing during DNA synthesis (see Chapter B), In both cases, formation of correct base-pairing interactions dramatically enhances the rate of a critical biochemical step. For the UNA polymerase, this step was the formation of the phosphodiester bond. In this case, it is the hydrolysis of GTP by EF-Tu. A third mechanism that ensures pairing accuracy is a form of proofreading that occurs after EF-Tu is released. When the charged tRNA is first introduced into the A site in a complex with EF-Tu-GIP, its 3' end is distant from the site of peptide bond formation. To participate successfully in the peptidyl transferase reaction, the tRNA must rotate into the peptidyl transferase center of the large subunit in a proccss called accommodation (Figure 14-32c). Incorrectly paired tRNAs frequently dissociate from the ribosome during accommodation. It is hypothesized that the rotation of the tRNA places a strain on the codon-anticodon interaction and that only a correctly paired anti-codon can sustain this strain, Thus, mispaired tRNAs axe more likely to dissociate from die ribosome prior to participating in the peptidyl transferase reaction. 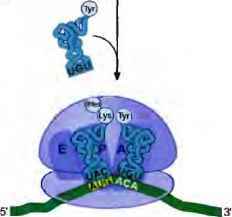 In summary, in addition to the codon-anticodon interactions, the ribosome exploits minor groove interactions and two phases of proofreading to ensure that a correct aminoacyl-tRNA binds in the A site. Each of these three additional selectivity mechanisms enhances the rate of peptide bond formation with correct codon-anticodon interactions and selects against incorrect interactions. How ribosome discriminate between correctly and incorrectly charged trna? How does the ribosome select the correct aminoacyltrna? Can ribosome distinguish between correctly charged and uncorrectly charged amminoacyl trna?